General Joffre, Commander in Chief of the French Army, visits the Verdun front. 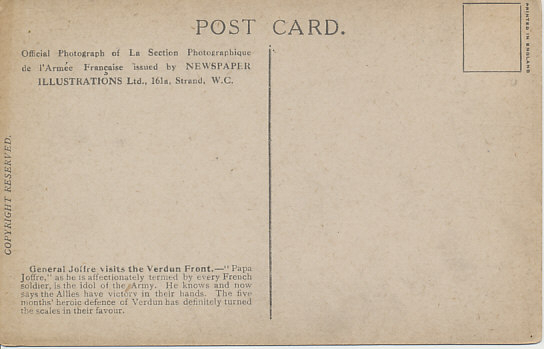 The card is from the summer of 1916 when the Battle of Verdun was in its fifth month. The caption on the reverse says Joffre then knew the Allies had victory in their hands, a victory that would not come for more than two years. 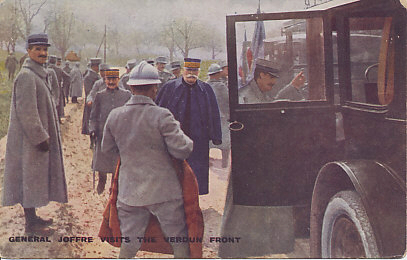 General Joffre visits the Verdun front. Official Photograph of La Section Photographique de l'Armée Française issued by Newspaper Illustrations Ltd., 161a, Strand, W.C.
General Joffre visits the Verdun front.—'Papa Joffre,' as he is affectionately termed by every French soldier, its the idol of the Army. He knows and now says the Allies have victory in their hands. The five months' heroic defence of Verdun has definitely turned the scales in their favor. Commander of the French army at the beginning of hostilities in 1914, Joseph Joffre, executing his Plan XVII to attack Germany, failed to anticipate the German advance through Belgium and how far west the invaders intended to go before turning south to invade France. He recovered and engineered the Allied victory of the Marne. During the long Allied retreat before the advancing Germans, Joffre remained calm, and reconfigured his commanders and armies to address the situation. Commanding the Paris garrison, General Joseph Gallieni saw the opportunity presented as the German First Army exposed its right flank to him. 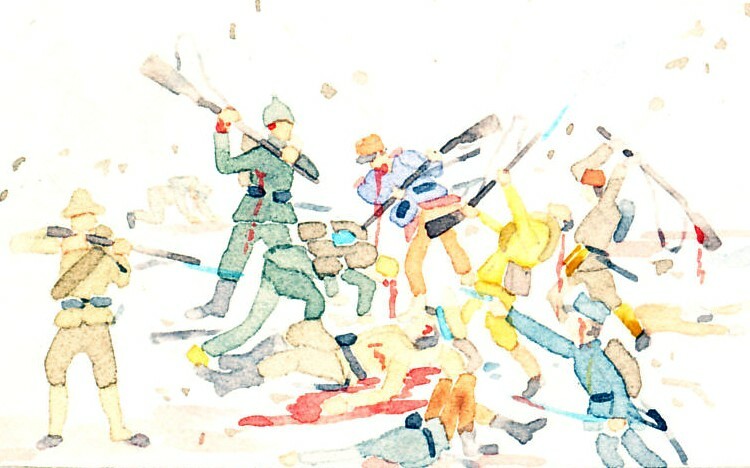 He attacked from the French capital on September 5, the day before Joffre ended his retreat with a counter-attack. During the Allied retreat, British commander Sir John French had been prepared to leave the battlefield, and return to Britain. Relations between Joffre and the British commander continued to be troubled. In the Race to the Sea, Joffre found the British to be inadequately aggressive. With the trench line in place, and from the end of 1914 through 1915, Joffre attacked in Artois and Champagne. Wrongly confident the war would soon be over, Joffre opposed the introduction of helmets for his men. Joffre and British commander Douglas Haig were preparing a joint offensive on the Somme when the German seige of Verdun began. Having seen how quickly the Belgian and French fortresses had fallen, Joffre was prepared to abandon Verdun, but was convinced of the political necessity of holding it. Haig and Joffre launched the Battle of the Somme, but with a lessened French force and a greater British. France's terrible losses and a lack of government confidence led to Joffre being replaced by Robert Nivelle.